We received several nominations of individuals devoted to improving long-term care services and supports. We appreciate the nominations that were submitted and are extremely grateful for the members of our Governing Board and Leadership Council that volunteered to serve on the Leadership Award Selection Committee to review the qualified nominees and select the award recipients. The Leadership Awards were presented during the 40th Annual Consumer Voice Conference in Arlington, Virginia and as Lori Smetanka, Executive Director shared, “This year’s award winners are a superb group of advocates who have worked tirelessly to make a difference in the lives of long-term care consumers. We can all aspire to the determination and energy of these award winners in their efforts to promote quality of care, quality of life and empowerment of residents." 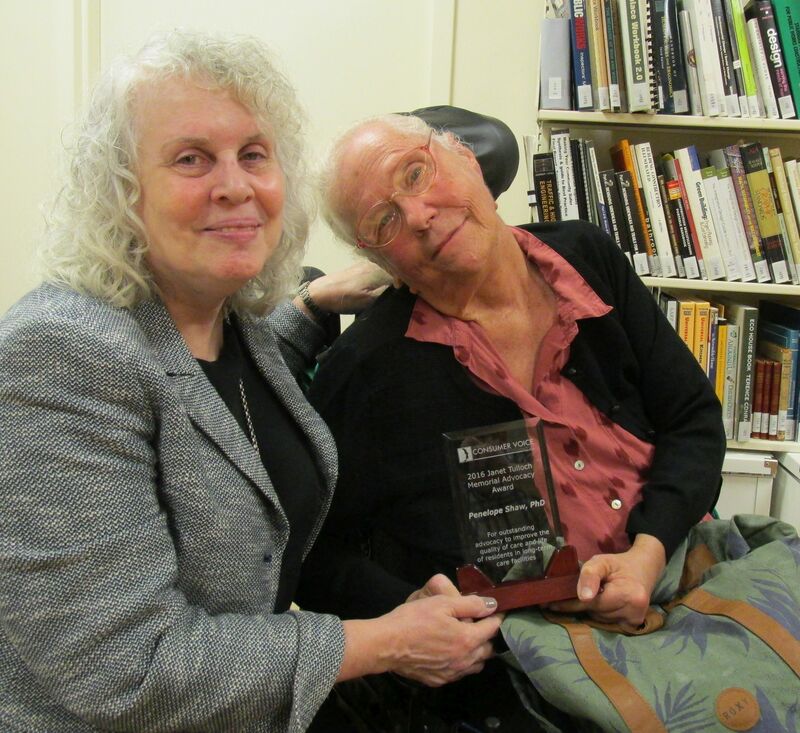 The award was established in 2000 after the death of Janet Tulloch, a nursing home resident, author, committed advocate, and long-time member of the Consumer Voice’s Board of Directors. It honors a citizen advocate, family caregiver, or long-term care consumer who has worked directly with and for residents to improve the lives of long-term-care residents. The Hinds Award was established in 2005 in memory of the late Howard Hinds, a Tennessee District Long-Term Care Ombudsman. Howard was a true champion for residents and for the ombudsman program as well as a passionate advocate on national issues. The award honors an individual who has effectively advocated for long-term consumers on the local level. Cernoria McGowan Johnson (1909-1990) set up the national program of Nursing Home Ombudsmen in 1974. The award in her honor is presented to someone whose work has had national impact or is a model for national excellence and who exemplifies accomplishment in his or her chosen field. The Consumer Voice’s Policy Leadership Award recognizes an individual who has provided exemplary leadership in the public policy field in advancing quality of care and quality of life for residents receiving long-term care services. Joe Rodrigues and Patty Ducayet accepte the award on behalf of NASOP. The Consumer Voice Public Service Award recognizes an individual or organization whose work has profoundly expanded coverage and public understanding of long-term care issues. Established in 2002 as a lifetime achievement award to honor a person whose life work exemplifies leadership in the field of long-term care reform, the award is also a tribute to Elma Holder, the Consumer Voice’s founder and friend. Elma’s personal commitment, integrity and vision shaped the organization and quality of care and life in long-term care.